This year my spring showers have been abundant. I have been to three showers in the last few weeks. I am honored to have added a bit of my creativity to a few of them. I had fun photographing each one. This weeks shower I made the shower favors for my nieces shower. I also made dual purpose decorations. You will see later in this post. For this shower of happiness, I designed the card with my +Silhouette America Cameo, using the print and cut feature. You can refer to my tutorial on cut and print here. I found the font that matched her invitations on my silhouette. I bought the card stock at +Tuesday Morning which was a great score. I purchased the wine corks at +Pier 1 Imports on clearance making the gift more affordable splurge. I did have to do my research to find 48 of them in the Chicago land area. Several stores were kind enough to ship them to me for free, one I had to pay shipping and a couple I picked them up in person. That is a long story. I will just say a, Great big Thank you to the customer service representative who helped make this task easier, as well as the local stores who shipped them for free. +Jo-Ann Fabric and Craft Stores is where I purchased the sheer green fabric for $4.00 clearance bolt as well as Navy Blue grosgrain & satin ribbon in variable widths. 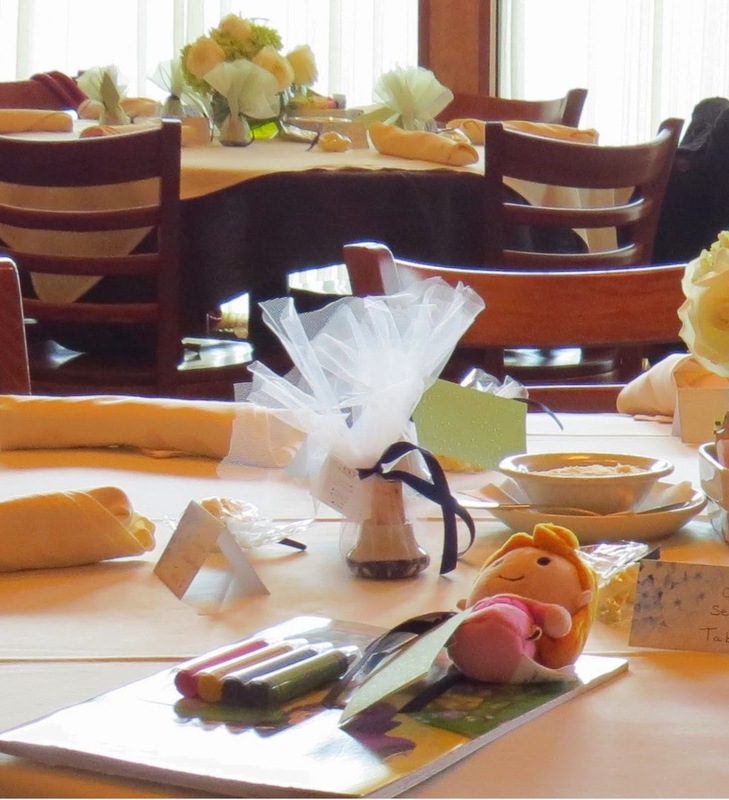 Tables are set, "Showers of Happiness to the Bride"
by customizing store bought napkins. I varied the sizes of the grosgrain ribbon, and used white thread in my sewing machine. Both techniques added more interest, to the 12 napkin set. These custom napkins,are simple, but cost effective decorations, which tied the room together for our shower. These decorations will continue to be used by the newly weds, as they match the decor in their home too. It's time to Pop that Cork & start the Party! that surrounds you this afternoon. Great job Karen. Everything looks perfect! YOU MADE BEAUTIFUL FAVORS AND DECORATIONS FOR OUR NIECES SHOWER!! THANK YOU FOR BEING YOU!! LOVE YA KAREN!! We sure are lucky Aunts to have such a Sweet Niece. Thank you for the compliments I feel blessed to be in the same family. Beautiful! I love the beverage station and the napkins that the couple will use!